The heyday of vintage enamel advertising signs was the 1920s to the 1950s; the era before television advertising really took off. Coloured signs advertising anything from cigarettes to chocolate began in the late nineteenth century and by the 1930s they shouted out their message from both small and large shops throughout the country. Advertising for Oxo or Cadbury's Bourneville can take you right back to the pre-war age. Although the golden age of these signs was well past by the 1970s, children from the that era will remember tin signs advertising Lyons Maid or Walls' ice cream. Collecting enamel or lithographed tin signs can be a great hobby. The signs show the evolution of graphic styles and marketing techniques, and nothing is more evocative of a particular period than vintage advertising. Vintage enamels signs can be a great addition to a retro style room. Fix one or two signs to plain walls to add a retro feel to a modern living or dining room. If you have a large garage a few motoring adverts from the 30s or 50s can help to give it that classic feel. Many collectors will chose a particular period, a particular product or even concentrate on one manufacturer. Here are a few suggestions to get you going. Cigarettes were heavily promoted by enamel signs in the 20s and 30s and into the 1950s. Lyons was the name for cakes in the inter war years. Lyon's Corner Houses became the place for an afternoon cup of tea and a slice of cake. Nothing is more reminiscent of the shopping experience of the 1920s and 1930s era than these enamel signs. This Cadburys sign, pictured left, conjures up images of children shopping for treats in the sweet shops in the 1920s and 1930s. Cadburys signs are just one of the many confectionary advertising signs of the era. Also look out for Rowntree's and Fry's. Fast forward to the 70s. I love this advertising sign for Walls Ice Cream with the two children happily eating lollies and ice cream. Lyons Maid ice cream signs were also common in the 70s. For most people cars and motorbikes were new and exciting in the 1920s and 1930s. There are a large number of signs advertising motoring products. 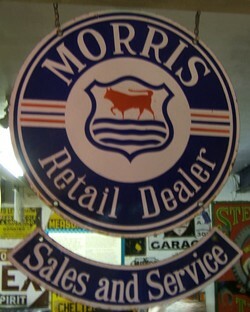 Look out for vintage signs for AA and RAC services, Shell, Esso and Mobil Oil and various makes of spark plug. 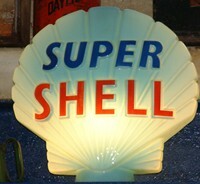 Also look out for vintage illuminated signs, such as this 'Super Shell' petrol pump sign from the 1960s. 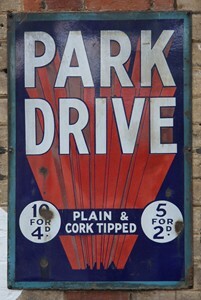 These signs can make great display pieces and are very evocative of the 1960s motoring era.